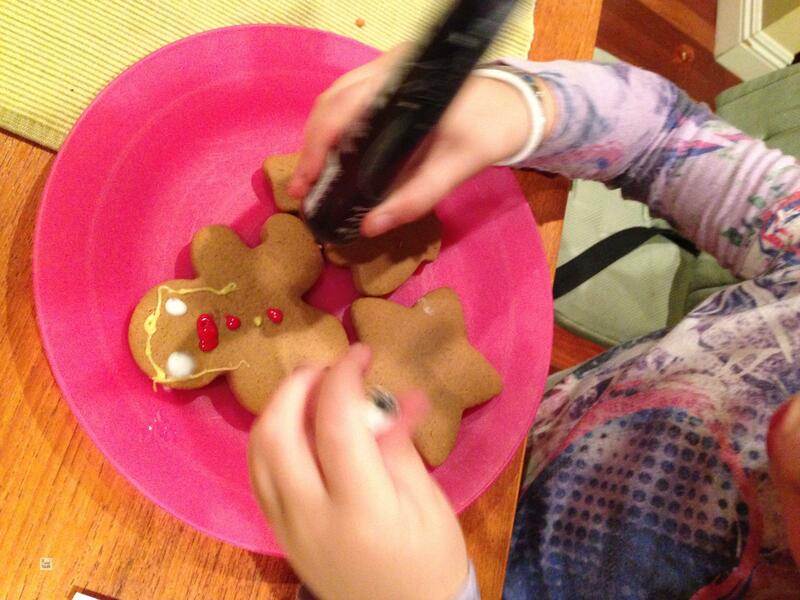 Last Friday, I got the kids together for some Christmas baking, so we set to bake and decorate Gingerbread Men. As the day approaches for the Gingerbread house party, I decided to try two different types of Gingerbread: This week’s is inspired in a Gourmet magazine recipe that can be found on Epicurious. 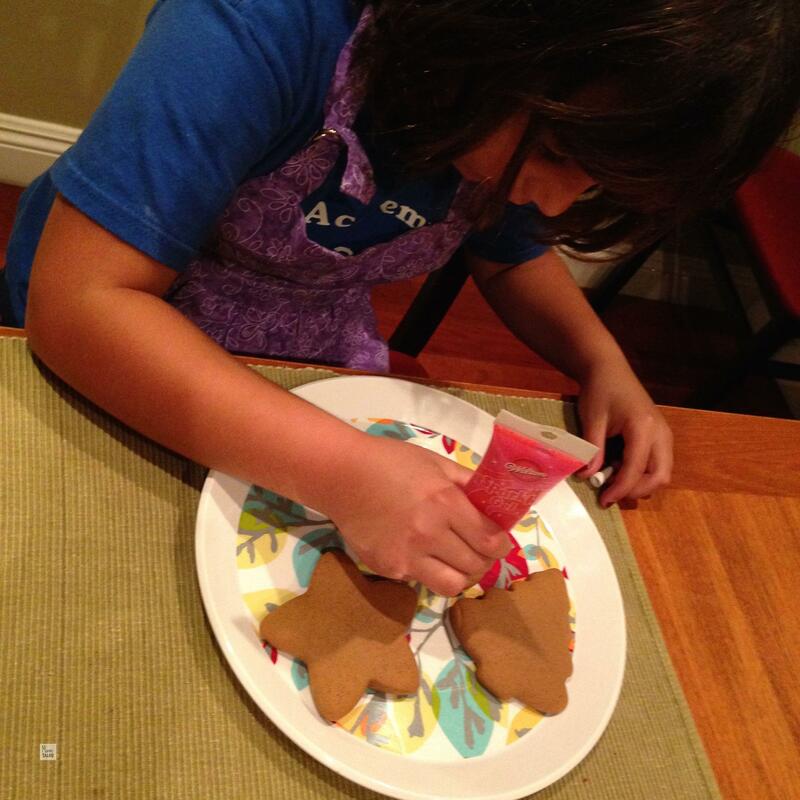 Next week we will be making a modified version of the traditional German Gingerbread, or Lebkuchen. Here’s the recipe for what we did, then I’ll follow with pictures of the kids decorating their masterpieces. Soft and chewy gingerbread cookies that do not require an overnight stay in the fridge. Bring molasses, maple syrup, brown sugar and spices to a boil in a medium sized pot over medium heat, stirring occasionally, and then remove from heat. Add the baking soda, stirring constantly (it will foam up, considerably), then add the butter in three stages, waiting for the butter to melt before adding the next batch. Once all the butter is melted, add the egg and combine. 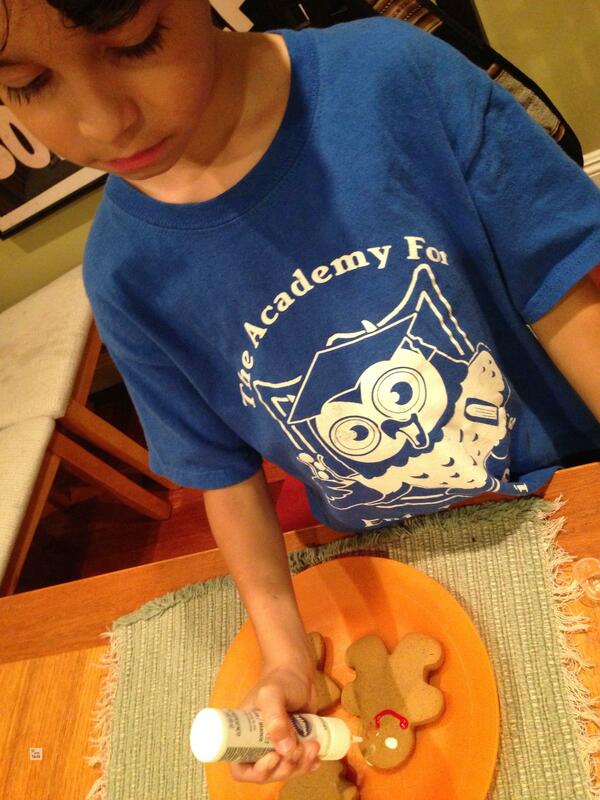 Then add the flour and sugar, until you have a soft dough. Preheat the oven to 325ºF, with the rack in the center of the oven. Transfer dough to a working surface dusted with flour, and knead incorporating about 1/4 cup of flour. The dough should be soft and easy to work with, not sticky nor stiff. Roll out the dough to about 1/8 to 1/4 of an inch (depending how thick you want your cookies), then cut out the figures. If your work space is not big enough, you can half the dough and keep the half you're not using wrapped in plastic wrap. Using a metal spatula, transfer the cut cookies to a cookie sheet lined with a silpat mat or parchment paper, spacing the cookies about an inch apart. Place in the oven and bake until the sides become golden, about 10 or 12 minutes, making sure not to burn the cookies. If you want to bake two batches simultaneously, use the upper and lower third of the oven, but switch the sheets halfway through so that the cookies won't burn. Place the cookies on the cooling racks, and let cool completely before decorating. Once out cookies were cool, the kids took the writing gels and icing tubes I had and got to work decorating. 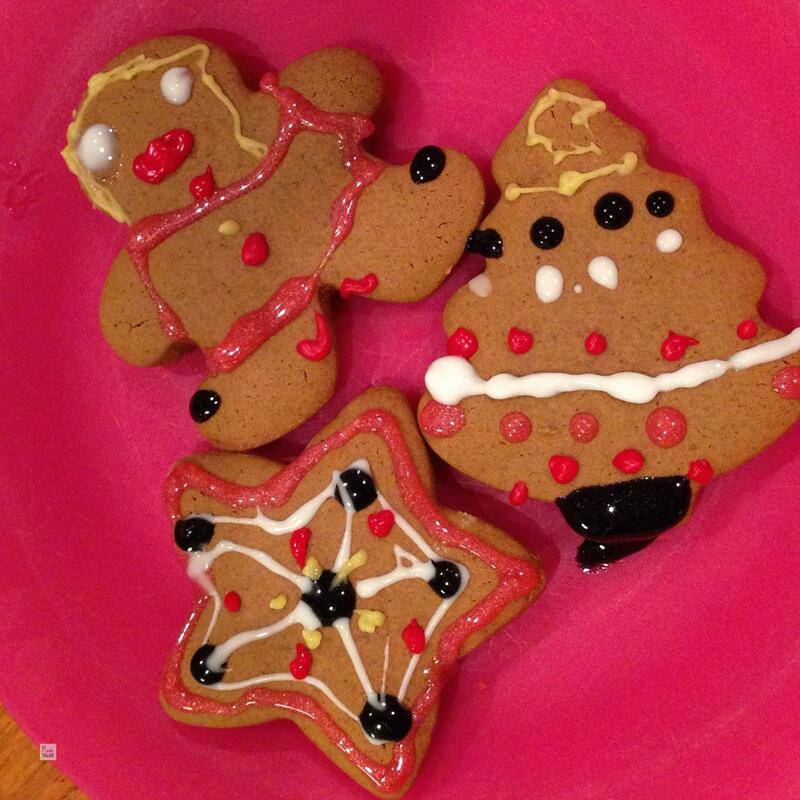 The best part, of course, was the decorating of the cookies. There were a few really cute designs, so I just got to watch and take pictures, as they were absorbed by their tasks. 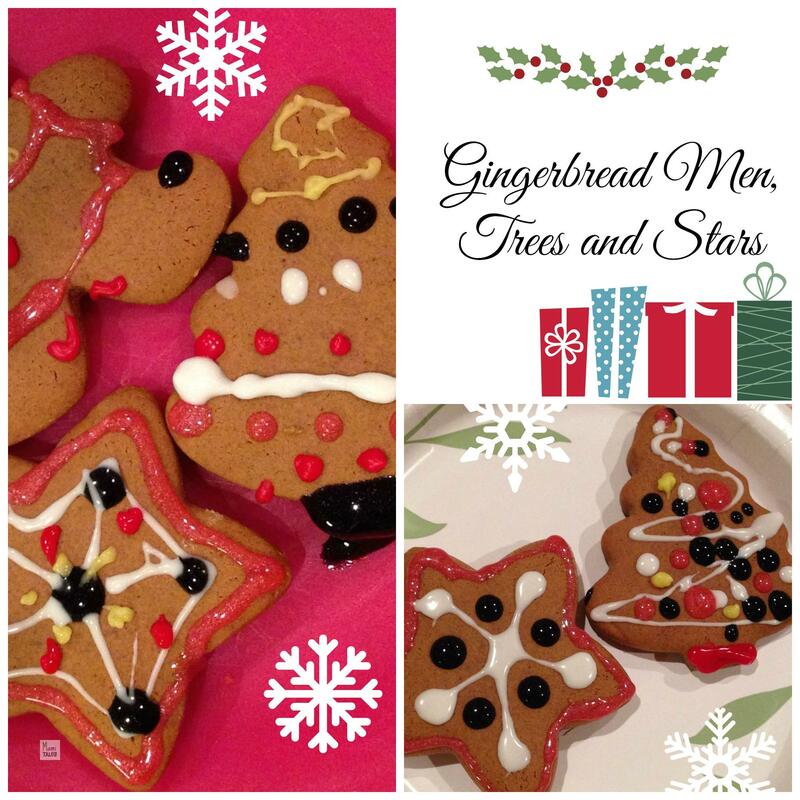 Our next gingerbread making match will have to stay overnight in the refrigerator, but I’m looking forward to try the differences in taste and texture to come up with my very own Gingerbread Men recipe for next year! Tagged Baking and Cooking, Cooking with Children, Holidays.